Re: CO2 is .04 percent of the atmosphere ! Actually I was joking but I also didn't notice the little red dot since the light was shining on the screen, I need to be more observant! I forgot to mention, I like the pic. It also graphically demonstrates that there is indeed no water shortage, even if there was a slight increase in the population since last year, the world is still covered with 2/3 water. Why ? Because CO2 is 0.04 percent of the atmosphere!!! In the Movie Prometheus they tell the Audience the planet has 3 percent CO2 and will kill them which is NOT true! Is this to reinforce the problems of Global warming ? and fear of CO2 the invisable inert gas? We've already established in this thread CO2 levels of up to 3 percent will not kill you. Prometheus (2012 movie): How much CO2 would be fatal within 2 minutes? subsequently - not knowing the difference between CO and CO2 - in a supposedly 'science fiction' movie? Carbon dioxide makes up 390 ppm of the Earth's atmosphere. That's 0.039%. Increasing this to 3% is pretty significant. The OSHA's maximum safe level is 3% (30,000 ppm); lethal concentration (death in 30 minutes) is 10% (100,000 ppm). So yes, they got something wrong. Given that they were just talking about "sucking on a tailpipe" in the line before that, it seems that this meant CO, not CO2. Of course if you say "C-O" out loud, most of the non-technical audience is not going to know what you are talking about. So this may have been changed to "C-O-2" when they re-record the dialog for ADR. Strange that the planet was so cold if the CO2 level was that high, which again makes me think it was CO. But on the other hand, CO is lethal at lower percentages than 3%. At 1.28% (12,800 ppm) you will go unconscious in a couple of breaths and die within ten minutes. That's pretty close to the two minutes suggested by the actor in the movie, but she skips the immediately unconscious part (for brevity, I imagine). Hey TB, thx for the revive! Good find, I remember in health class we were being taught that exhaled breath for CPR purposes can be up to 16% CO2 to be effective. I'm not about to argue the facts with rhetoric. These people are too dangerous minded to be considered truthful, we need to expose the agenda, cut to the chase, we all most need to die, who is left gets to be lucky NWO slaves, gee, simple. 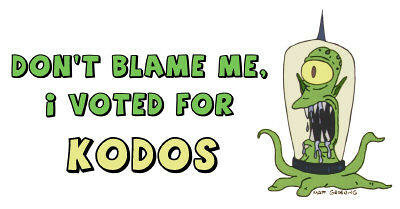 I keep noticing the "don't blame me, I voted Kodos!" signs. Now we need "Got Election?" motifake contest here, ideas welcome, winner gets me to make one based on your idea! Your plants will grow faster ! Be afraid be very afraid! bump ==== It's still Point .04 percent of the air you breath ! Actually Tahoe, at present free air CO2 is between 383 and 395 parts per million or .0383 to .0395%. Since we began seriously measuring it directly in the 1950s the readings have fluctuated as much as 0.002%. Over the last 25,000 years it has fluctuated as much as +/- 0.02% as has been shown through study and measurment of CO2 within ice core samples and other ancient sample testing methods. I recently had a conversation with a climate believer and there is no conversation ... its a religion to them , like a death cult.